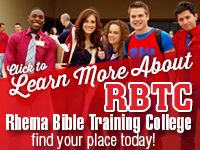 When we want to understand God's will about a subject, we go to God's Word. God's Word is God's will. And the Bible tells us that healing is the will of God. The Bible also tells us, "For ever, O Lord, thy word is settled in heaven" (Ps. 119: 89) and "Heaven and earth shall pass away: but my [Jesus'] words shall not pass away" (Luke 21:33). 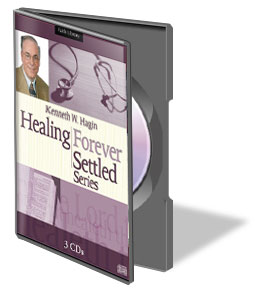 Healing is a forever-settled subject because God's Word is forever settled! Most of us understand that God dealt with the sin problem of humanity by sending His Son Jesus to be a Sacrifice and a Substitute for us. Isaiah 53:5 says, "He was wounded for our transgressions, he was bruised for our iniquities. . . ." First Peter 2:24 says, "Who his own self bare our sins in his own body on the tree. . . ."
So we know that God dealt with the sin problem in Christ's great substitutionary work. But both of these scriptures also state that God dealt with sickness and disease for us in the same act of redemption. The prophet Isaiah declared God's will concerning healing when he said about the Messiah, "with his stripes we are healed." The Apostle Peter restates God's will concerning healing in First Peter 2:24: "by whose stripes ye were healed." Isaiah prophesied of the coming Messiah and of redemption. Peter was an eyewitness to what took place as described by Isaiah. He was present when the Roman soldiers put those stripes on Jesus' back and hung Him on the cross at Golgotha's hill. Let's look at another New Testament counterpart of Isaiah 53:5. 17 That it might be fulfilled which was spoken by Esaias [Isaiah] the prophet, saying, HIMSELF TOOK OUR INFIRMITIES, AND BARE OUR SICKNESSES. By healing the sick in His earthly ministry, Jesus was fulfilling Isaiah's prophecy ("with his stripes we are healed") before He ever went to the cross and legally obtained redemption for us. Friend, healing is one of the benefits of our redemption! According to the Word of God, Jesus not only died and rose again for our sins, but He died and rose again for our sicknesses and diseases too. 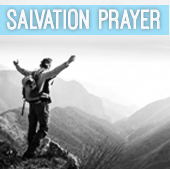 Healing belongs to us just as salvation belongs to us. Healing is part and parcel of our redemption! 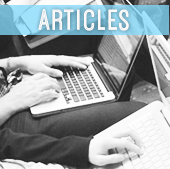 Looking at the Psalms, we again see that healing is one of the benefits of our redemption. Psalm 103:2-3 says, "Bless the Lord, O my soul, and forget not all his BENEFITS: Who forgiveth all thine iniquities; who healeth all thy diseases." Notice verse 3 says the Lord heals all of our diseases . . . not just a few, and not just our minor ailments. The word "all" means nothing left out. Nothing is left out of the redemptive work of Christ: not a headache, not a stomachache, not any kind of cancer, nor any kind of heart trouble. 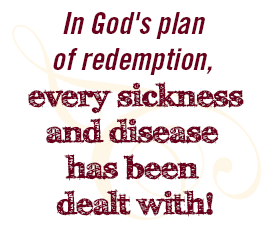 In God's plan of redemption, every sickness and disease has been dealt with! 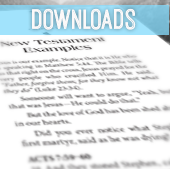 Now, what about Jesus, Who consummated our redemption in His death, burial, and resurrection? Jesus came to the earth to do the will of the Father. In fact, over and over again, Jesus said, "I have come to do the will of Him who sent Me." In John 14:9, He said, "He that hath seen me hath seen the Father." As Jesus walked this earth and fulfilled His earthly ministry, He was the will of God in action! Let's look at yet another passage of Scripture that further illustrates God's will concerning healing. 12 And it came to pass, when he [Jesus] was in a certain city, behold a man full of leprosy: who seeing Jesus fell on his face, and besought him, saying, Lord, if thou wilt, thou canst make me clean. The question concerning God's will to heal is answered very explicitly in this passage. In verses 12 and 13, when the leper questioned Jesus specifically concerning His will to heal, Jesus answered, "I will!" 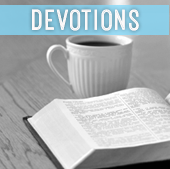 The New International Version says, " 'Lord, if you are willing, you can make me clean.' Jesus reached out his hand and touched the man. 'I am willing,' he said. 'Be clean!' And immediately the leprosy left him." The New English Bible translates this verse: " 'Indeed I will; be clean again.' " Another translation says, " 'It is my pleasure; be clean.' "
Verse 12 of the King James Version says the man was full of leprosy, indicating he had leprosy that was in the last stages. Leprosy is a horrific disease that deforms and mutilates the body as it progresses. We can gather from this verse that since the man was full of leprosy, the disease was probably more advanced than just a spot on his arm or leg. Yet with one sentence from the Master's lips: "I will: be thou clean," the leper was healed (v. 13)! Jesus Is Willing . . . Be Healed! Most Christians today don't have a problem seeing Jesus in His earthly ministry as the Healer. They don't question that He was anointed by God and that He had the power to heal sickness and disease (Luke 4:18-19; Acts 10:38). Most Christians don't even question so much Jesus' ability to heal people today as they do His willingness to demonstrate that healing power on their behalf. However, any question about Jesus' willingness to heal is answered very vividly in this account of the leper in Luke chapter 5. And since Jesus hasn't changed (Heb. 13:8; Mal. 3:6), and He was willing to heal then, He is willing to heal now. He's willing that you be healed. 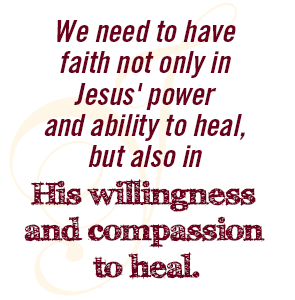 We need to have faith not only in Jesus' power and ability to heal, but also in His willingness and compassion to heal. We should no longer question whether or not Jesus wants us healed, because He provided healing for us in His great act of redemption. And He is the same yesterday, today, and forever. He hasn't changed! He is still saying today, "I will!" Do you realize that it is God's will for you to be healed? 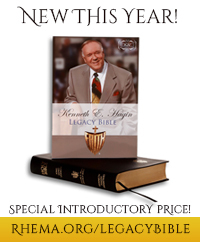 Take a closer look at the scriptures that prove this is so, and learn to walk in the divine healing that is available for you today!